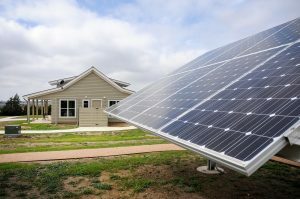 Instead, we hope you’ll join us for an expert-guided look at the green features – including the on-site solar energy system – of the Austin Central Library. 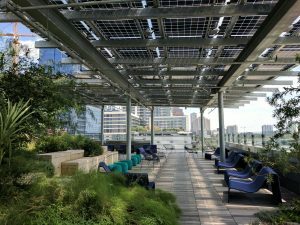 This LEED Platinum-certified building opened late October 2017 has the distinction of being the first new building with a solar array on the downtown sector of the electric grid, which comes with added complications. Because we want to do the tour before it gets dark, we’ll be starting our program a bit earlier than usual. The presentation will start at 5:45, but please join us even if you’ll be a bit late. When: Tuesday, February 26, 5:30-8:00 p.m. The lead architect Jonathan Smith, of Lake Flato Architects, and solar designer Bungane Mehlomakulu, of Integral Group, will be leading the tour and discussion. Jonathan Smith, AIA, LEED AP BD+C, is an Associate Partner at Lake Flato Architects. Jonathan’s designs foster meaningful and lasting relationships between building occupants and the natural environment, demonstrating excellence in the art of building, the science of sustainability and love for the natural landscape. Jonathan has a strong passion for transformative projects that have an impact beyond their property lines through environmental sustainability, performance-based design and response to climate. Jonathan was Project Architect on the LEED Platinum 180,000 square foot new Central Library in his hometown of Austin, Texas. In 2018 the Austin Central Library was named one of Time Magazine’s World’s Greatest Places. Jonathan is currently working on projects in Texas, California and Hawaii. Bungane Mehlomakulu, PE, LEED AP BD+C, is a Managing Principal at Integral Group in Austin. Bungane is a design principal working at the boundary between architecture, engineering, and sustainability to deliver a balanced, efficient, and meaningful services to customers and clients. His passion for sustainable building design and operation made him an expert in passive strategies including natural ventilation, daylight harvesting, plug load reductions, and solar control and the application of energy efficient technologies, including radiant floors, displacement ventilation, and chilled beams. Our Annual Solar Achievement Award goes to H-E-B Grocery Company, LP this year. We chose to honor H-E-B for their stand out Hurricane Harvey relief work and extensive adoption and support of clean energy. Tickets are $25, $15 for students with valid ID, or $30 at the door and include a drink and appetizers. Get yours now to join us for a fun night supporting clean energy and good local jobs while honoring H-E-B’s support for solar power and victims of Hurricane Harvey! Friday, December 15th, 7 – 10 p.m.
H-E-B immediately donated $100,000 for Harvey relief, subsequently providing other monetary and volunteer support, the company’s mobile kitchens, and more that 1,000 truckloads of water in the first 72 hours of the crisis to support victims of Hurricane Harvey—support estimated to be worth a total of $3 million. On top of H-E-B’s generous disaster relief support, the company has spent over $10 million implementing solar power systems in 20 of its Austin-area stores and 2 distribution centers, which will be able to produce 4.9 millions kWh of energy per year and brings the retailer’s overall solar energy production to 12.1 million kilowatt-hours per year. Additionally, H-E-B donated $1 million to the San Antonio River Foundation to help fund Confluence Park, a project which will serve as a learning destination to teach visitors about sustainability and conservation practices like solar power and rainwater harvesting. Live music by Jenny Parrott and her band! With every passing day, society’s reliance on fossil fuels further exacerbates the climate change crisis. The reality of climate change impacts on central Texas is sobering—unless we move past fossil fuels, even more severe storms, droughts, and extreme heat will become the new normal. Knowing these facts while watching Trump pull the US from the Paris climate Change agreement was horrifying. Fortunately, Trump’s decision has served to galvanize many local leaders to redouble their action—Austin Mayor Steve Adler is one of those local climate leaders reaffirming commitment to the Paris Accord. Solar Austin is excited to present Mayor Adler as our August Happy Hour speaker. 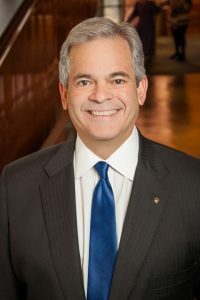 August 22, 5:30 – 8:00 p.m.
Mayor Adler will share his views on the decision to pull out of the Paris agreement and how Austin fits in among a coalition of cities both taking action right now and planning future efforts to reduce our carbon footprint and general environmental impact. Austin’s Community Climate Plan provides a roadmap for the Austin community to achieve carbon neutrality no later than 2050 through efforts to reduce and hopefully eliminate greenhouse gas emissions from electricity production, natural gas, transportation, solid waste management and industrial processes. Action items include investing in renewable energy, investment in energy storage, mass transit, expanding composting, and promulgation of electric vehicles and smart grid technologies. Join us to hear from Mayor Adler about Austin’s efforts to reduce the community’s impact on the climate and what you can do to make a difference.